Betws-y-Coed: Accommodation, Attractions, Activities, Going Out, Shopping, Things to Do, Places of Interest, Outdoors, Betws-y-Coed Holidays, Betws-y-Coed Area Location, North Wales. 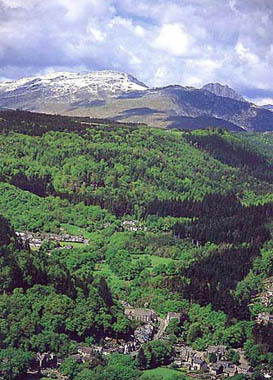 Betws-y-Coed is known as North Wales' most popular inland resort. Here the River Conwy meets its three tributaries flowing from the west, the Llugwy, the Lledr and the Machno. It is set in a spectacular wooded valley close to the breathtaking Swallow Falls. Betws-y-Coed is the ideal base from which you can explore the beauty and history of Snowdonia and all around North Wales. It has a wide choice of accommodation open throughout the year and high quality shops to cater for all tastes. Popular activities in this area are walking, climbing, water sports, fishing, golf, dry slope skiing, horse riding, swimming, mountain bike trails. Exploring in and around Betws-y-Coed you will see: St Michaels Church, Motor Museum, Railway Museum, Fairy Glen, Miners Bridge, Swallow Falls, Conwy Falls, Neolithic Tombs, Woollen Mills, Trefriw Wells Spa , Gwydyr Forest with 19 local walks, Moel Siabod, Gwydyr Castle and Chapel. Close to Betws-y-Coed: Bodnant Gardens, Snowdon, Electric Mountain, Conwy and Conwy Castle, Llechwedd Slate Caverns, Ffestiniog Railway, Llandudno, Caernarfon Castle, Beddgelert, Anglesey, Penrhyn Castle, Portmeirion. Welcome to Betws-y-Coed and the Conwy Valley: the perfect holiday location for exploring the tourist attractions of Snowdonia and North Wales. Betws-y-Coed and the surrounding villages within the Snowdonia National Park. Betws-y-Coed Golf Club in Snowdonia Conwy Valley, Snowdon, Snowdonia National Park, North Wales.